Most people have heard of the famous Steiff Teddy Bear but not many know about the courageous inventor of the Steiff line of toys. Margarete Steiff was born in 1847 in Giengen, Germany. She was the third of four children. When Margarete was only 18 months old she suffered a high fever which caused her legs to become paralyzed and her right arm to become painful to use. After many years of doctor visits and attempted cures she was diagnosed with polio which had no cure. Although her parents felt some hopelessness, Margarete on the other hand fought to lead a normal life. She bravely attended school. Her siblings and neighbors took turns pushing her to school in a handcart and a woman living near the school carried her up the stairs to her classroom every day. Even though Margarete suffered pain in her right hand she still took sewing lessons and completed her training as a seamstress at the age of 17. In 1862 her older sisters opened a dressmakers shop and Margarete worked as a seamstress for them. Eight years later, her sisters moved away and her father made a workroom for her at the family home. She soon purchased her own sewing machine. In 1902 her nephew, Richard, designed “Bear 55 PB”, the world’s first toy bear with jointed arms and legs. The bears were made from mohair plush. In 1904 an American businessman ordered 3,000 bears and they became all the rage in America. From 1906 forward, they sold under the name, “Teddy Bear”, after President, Theodore “Teddy” Roosevelt. 1904 brought the “Steiff – Button in the Ear”. 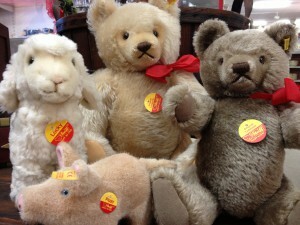 The trademark was added to designate the high quality Steiff toys from other imitations. In 1909, Margarete Steiff died at the age of 61 of pneumonia. Although it was a big blow to her family, friends and employees, her nephews were able to take over the company and Steiff remains one of the best loved toy manufacturers in the world. ← Have A Very Vintage Christmas!